The Information Technology (IT) Service team, in partnership with Modo Labs and Appian, have launched a new iToros Mobile app, designed to help students access important campus resources and services. Earlier this year, Bill Chang, associate vice president of Development & Digital Convergence, along with student focus groups and IT Student Assistants, began to work behind the scenes to bring new features and functionalities to the app. The previous iToros Mobile app was first introduced to students in 2012. It offered an array of features, including dining information, a campus map, student account information, directories, and even access financial information. But it drew criticism for not being user-friendly enough. The current state of a mobile, app-driven world, has affected the lives of college students. According to a Mobile Fact Sheet from Pew Research Center, 80 percent of U.S. adults with some college education own a smartphone. CSUDH’s IT team has embraced the popularity of mobile use, a central component of student retention and student engagement, and stand committed to improving technology. 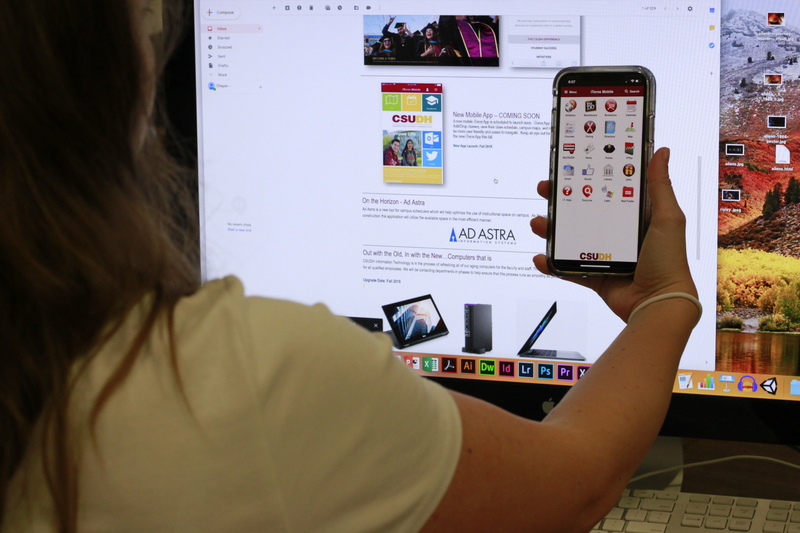 Available free in the Google Play store and Apple App store, the app offers students secure access to MyCSUDH portal to view their class schedules and grades, search for classes and enroll in classes. The app also delivers the latest university news and events and provides access to important university resources such as study labs, academics, interactive CSUDH social media, and more. Chang said the mobile app has a new look and feel that is categorized in a way that the end users will know where to find things in a mobile-friendly format. “For the Toro nation, we’re looking to provide them with an easy way to access the information that they need from their phone, and an easy way to update their schedules or courses or added classes, drop classes, the core fundamentals of functionalities that students use most of the time in their MyCSUDH portal at the hands of their fingertips via the phones. We’re hoping with that by giving them the ability to access the information from their phones, and the ability to update the data information they need from the portal on their phones, it’ll help them kind of do what they need to do get the information that they need to know,” Chang said. As with all mobile apps, updates and new features are constantly being deployed. “So, the next piece that we’re looking to do is trying to make smart planner available via the mobile device,” Chang said. This new feature, which will be included in the next update, will definitely distinguish CSUDH’s iToros Mobile app from other college mobile apps. “There’s only one other school that I know of that has the capability of updating smart planner on their mobile app now, which is San Marcos. I think we’ll be the second one,” added Chang. The smart planner is a critical feature that will help students plan out their class schedule and stay on track for graduation. Additionally, when students update their smart planner it benefits the entire university as a whole. “We use that information and that data to help our colleges and our departments plan out the right number of sections for each of those courses,” Chang said. The app can be updated based on real-time feedback from students and staff, ensuring that it reflects the specific priorities of the CSUDH community. You can download the free iToros Mobile app in the Google Play store and Apple App store (still pending release).